Wreaking havoc in the farmers’ fields in the districts of Rohtak, Hisar, Sirsa Jhajar and Bhiwani, the blue bull, called Neelgai in local parlance, with its ever increasing population is causing great anguish to the farming community in Haryana. The dispute over the proprietary rights on irrigated land between farmers of Uttar Pradesh and Haryana adjoining the Yamuna has deepened with reports of kidnappings, violent clashes and arrests in the past couple of days. Mr Rattan Lal Kataria, Member Parliament and former president of state unit of the BJP, while talking to mediapersons here today made it clear that his party’s alliance with the Indian National Lok Dal in Haryana would continue. When asked about the alliance in the next Parliament and Assembly elections, Mr Kataria stated that it would be decided by the party high command. Almost 48 hours after a Dalit woman, who was allegedly stripped naked by five men in the presence of her son at Bainsi village under Meham police station in this district of Haryana on November 5, lodged a complaint with the police, there is still no clue about the whereabouts of the accused. They are the blind admirers of the President, Mr A.P.J. Abdul Kalam. The admirers in question — Ajay Kumar, Rishiraj, Manoj Kumar, Naresh Kumar Rana and Rakesh Kumar — are blind who are holding a demonstration in front of the 30 Bays Building here for more than month demanding jobs in the Haryana Government under the quota for visually handicapped. The din over 100 years of the Kalka-Shimla rail section notwithstanding, railway tracks from the Raj period find no place in the celebrations. Three members of a family, including a woman and a child, were killed in an accident on the New Delhi-Ambala highway near Nilokheri 12 kilometres from here today. Three other members of the family were seriously injured. In just over a year after a Sirsa-based journalist, Ram Chander Chhatarpati, was murdered for allegedly writing against a religious organisation, a Division Bench of the Punjab and Haryana High Court today directed probe by the Central Bureau of Investigation into the matter. Additional District and Sessions Judge D.S. Sheoran, after hearing the arguments on the bail application of former Union Minister and Congress MLA Jai Prakash Barwala, reserved his decision till tomorrow. The elite Indian Air Force Surya Kirans are all set to emerge as the world’s best formation aerobatics team. The Surya Kiran team is likely to participate in an international meet in Singapore. The team is gearing up for a heart-stopping display at the Asian Aerospace 2004. AMBALA: An aircraft, which remained buried under soil in the Markanda river bed for more than five decades, has been finally dig out and restored to its former glory by the Air Force. The Spitfire aircraft had crashed in 1947 near Rolaheri village in the Mullana area. Various competitions were held at Bal Bhavan, Ambala City, today. In the fancy dress competition, 3-7 years, Ashima and Aditya were first, Manisha and Vasu second, and Saristi and Sayna third. Consolation prizes went to Astha, Inder Rattan and Gurnoor Singh. A former Haryana Minister, Mr Mehar Singh Rathi, died last evening after a brief illness. He remained a Cabinet Minister in the Bhajan Lal and Devi Lal Governments. Mr S.K. Maheshwari, a senior I.A.S. officer of the Haryana cadre, died following brief illness here this evening. He was admitted to the PGI three days ago following development of a clot in the brain. Unfortunately he slipped into coma. With a horse-like appearance with blue tinge, the animal moves around in herds, invading fields and causing largescale devastation. The damage is not just restricted to standing crops but their foray into inhabited areas has caused many accidents as the blue bulls dart across the highways. Ironically, the three states of Haryana, Punjab and Rajasthan, facing the problem posed by the blue bulls has devised separated parameters for dealing with the destructive animals. While the Haryana government has banned the killing of the animal, Rajasthan and Punjab have relaxed rules for its hunting. The conflict has become so acute that at some places the harried farmers not only shot the animal but resorted to dangerous techniques like laying live electric wires around their fields to ward off the invading animal. Though the technique proved partially successful, it has also cost some human lives as in one instance two young brothers were electrocuted by wires in the fields in Fatehabad district. Interestingly, even as the animal has come under sharp focus in three states, the Bishnoi community has been fighting the authorities against issuing licenses to kill the animal. In case of Punjab and Rajasthan, the government decision’s to relax rules for hunting of the animal has been governed by strong demands from farmers, who complained of largescale devastation of their crops by blue bulls. Although, the animal is listed under the Indian Wildlife Protection Act of 1972, it is not an endangered species. The problem has become so acute in the belt from Jhajar to Ganganagar and Hanumangarh in Rajasthan that the Haryana Agriculture University (HAU) has instituted a study to assess the extent of damage that the animal is causing. “The conflict over the issue is becoming more and more intense so an arrangement has to be worked out to strike a balance to protect the animals and at the same save the standing crops,” is how Dr R.S. Dalal, head of Veterinary Extension department at HAU feels. “The animals coming in big herds and ruining the crops has become too frequent, causing huge loss to the farmers,”rues Surinder of Balsm village, located on the Haryana-Rajasthan border. The villagers say the animal feasts on barley, wheat, millet, mustard and pulses. In fact, the blue bulls have rendered futile all efforts by the scientists of the HAU to encourage diversification of crop in the dry and arid areas. “The animal is particularly fond of pulses, which we were trying to popularise as a summer crop with the help of sprinkler irrigation, but seeing the ruination caused by them farmers are reluctant to invest in it,” said Dr Dalal. The scientists feel it is high time the government took steps to prevent the damage to crops by blue bulls and suggest chalking of a joint strategy by the Wild Life and Agriculture department, along with the HAU. 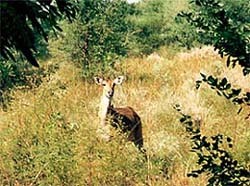 They say the population of the animal has crossed 50,000 in Haryana due to the ban on its hunting. Notwithstanding the devastation the animal is causing, the Bishnoi community, with its frenzied commitment to protect the blue bulls, is opposing any move to permit its hunting. The Karnal police has arrested three residents of Begipur village in Saharanpur district on charges of forcibly intruding into Choti Jadoli village of Karnal district and destroying the standing crop. The police also arrested some residents of Nangla Rai village in Saharanpur district who had kidnapped five residents of Tamshabad village in Panipat district along with their cattle. They were later released with the intervention of the police. The dispute over the irrigated land between the farmers of Uttar Pradesh and Haryana deepened on November 6 when a group of persons belonging to the Uttar Pradesh village tried to take the control of the land. Having realised that they could not retain control on the irrigated land for long, they destroyed standing crop of wheat and sugarcane on dozens of acres and returned to their state. The villagers of Choti Jadoli brought the matter to the notice of the local police and district administration. The Deputy Commissioner of Karnal, Mr R.S. Doon, has asked the local revenue authorities to find out the exact position of the disputed land from the revenue records and ascertain the situation so that the matter could be taken up with the Uttar Pradesh Government. The tehsildar of Karnal, Kanungo and Patwari visited the disputed land on Sunday and met the villagers to ascertain the situation. The villagers of Choti Jadoli briefed the revenue authorities about the dispute and showed the destroyed crop. The villagers, meanwhile caught hold of three persons belonging to Begipur from their land and handed them over to the police at Karnal. They were identified as Kala, Sehna and Samay Singh. Sharp-edged weapons and a tractor were recovered from their possession. They were later produced before a local court that sent them to police remand for two days. Mr Rattan Lal Kataria, Member Parliament and former president of state unit of the BJP, while talking to mediapersons here today made it clear that his party’s alliance with the Indian National Lok Dal (INLD) in Haryana would continue. When asked about the alliance in the next Parliament and Assembly elections, Mr Kataria stated that it would be decided by the party high command. He said he had met the Chief Minister of Haryana, Mr Om Prakash Chautala, at least 10 times during his tenure as the party chief and had tried his best to maintain cordial relations with the INLD. He said popularity of the BJP in Haryana had increased manifold in the past four years and the added that the BJP would come to power in all four states — Rajasthan, Delhi, Madhya Pradesh and Chhattisgarh — as the Congress had failed totally in giving justice to the people in these states. He predicted that the BJP would get 300 seats in the next Parliament election and to achieve the target the party had started Mission-2004. He said after a public meeting at Panipat it had been decided to organise a state level rally on December 21 at Hansi in Hisar district. It would be attended by Mr L.K. Advani, Deputy Prime Minister and Mr M. Venkaiah Naidu, BJP, president. He said during the tenure of Mr Atal Bihari Vajpayee as Prime Minister a lot of schemes for those belonging to the Scheduled Castes, Schedule Tribes and Backward Classes had been introduced. Mr Kataria stated that Dr Ambedkar National Scholarship Scheme had been launched under which meritorious students from SC/ST community obtaining the top three ranks in the Class X examination from any state education board would be granted scholarship worth Rs 60,000, Rs 50,000 and Rs 40,000, respectively. Mr Kataria stated that in 2002-03 alone over 18 lakh SC, five lakh ST and six lakh BC students had been awarded scholarships. He said the fund allocation for various schemes meant for tribesmen had increased by about 70 per cent from 1999 to 2003. He said a Scheduled Tribe Finance and Development Corporation was set up in April 2001, with the authorised share capital of Rs 500 crore as an apex institution for financing economically viable projects for Scheduled Tribes. He informed that loans to the tune of Rs 6,024.58 lakh in 2001-02 and Rs 2912.51 lakh till August 2002 had been released to tribal enterprises. According to sources, the police raided a few places in search of the accused, but their efforts proved futile. Earlier, the police had tried to downplay the incident. But after the matter came to the notice of top police officials, several raids were made to nab the accused, but in vain. Jagroopi and her son, Azad Singh, were forcibly ‘’picked’’ from their house on November 5 night by Gulab, Puri, Parma, Vinod and Gundi and taken to the house of Gundi. The mother-son duo were allegedly beaten up by the accused to force information from them about the whereabouts of Jagroopi’s teenaged son, Jai Hind, who had eloped with Gundi’s daughter, Nandi, a mother of two, in March this year. Nandi was married to a resident of Bohar village. Ever since the elopement, tension had been brewing between the two families. They are the blind admirers of the President, Mr A.P.J. Abdul Kalam. The admirers in question — Ajay Kumar, Rishiraj, Manoj Kumar, Naresh Kumar Rana and Rakesh Kumar — are blind who are holding a demonstration in front of the 30 Bays Building here for more than month demanding jobs in the Haryana Government under the quota for visually handicapped. Since the state government is indifferent to their demand, today an 11-member team of the Netrahin Jagriti Sangh, the outfit spearheading the agitation, has set on foot for Delhi to give a memorandum to the Prime Minister. “We are sure the Prime Minister will meet the delegation. In case he does not, the President, Mr A.P.J. Abdul Kalam will certainly do. He appears to have his heart in the right place”, says Ajay Kumar. The rag-tag group, who is doing the sit in since September 29, says they are also grateful to the UT police for the humanitarian treatment. “The cops help us in going through the daily chores. When some of the volunteers tell ill with dengue, it is the cops who shifted them to a hospital”, the agitators say in unison. Some of the shop owners of the area are also stated to have taken a sympathetic view of the blind youths’ demonstration. Pointing at the jute mat spread over the wooden platform being used for sitting by the agitators, Ajay Kumar said it had been provided by the carpet showroom across the road. At night the agitators go to the Haryana Government offices located in the Bays Building to sleep. For bath etc, they use the wash rooms of the offices. Earlier, one agitator hurt himself severely when he fell down from the third floor of the building. But the incident has not dampened the spirit of the other volunteers. “ It is a do or die battle. We are ready to do anything to persuade the government to give us what we deserve”, says Sunil Kumar. Sunil, who claims to have obtained an advance degree in playing ‘tabla’, said his father was working as a farm labourer in a village in Karnal. His brother too works as a farmhand in the village. With the meagre income of the household, the family is having a tough time in supporting him who does not have any income but Rs 200 as monthly allowance provided by the government. The condition of Rakesh Kumar, a 26-year-old higher secondary qualified youngman from Jhajjar district, is even worse. He has no one to support him but his mother whose only means of subsistence is the Rs 200 per month she gets from the government as widow pension. The others also hardly fare better as far as financial standing go. Rishiraj (36) has lost his parents and now he is dependent on his married sisters, one of whom live at Gurgaon and other at Chandigarh. He stays alternately with his sisters and the humiliation of such an existence has made him desperate. He is trained at making cane chairs and hopes to get a job in one of the state government offices which have provision for recruiting someone like him. Ajay Kumar (25), who claimed to have done MA in political science as well as B.Ed, has two bothers who too are blind. However, the brothers have managed to get government jobs. Manoj Kumar (25) has also his father and is now dependent upon his brother who owns a shop at Jhajjar. Manoj is a graduate. The agitators had met the Haryana Chief Minister, Mr Om Prakash Chautala, about ten days back and presented a memorandum to him. One per cent quota for blind people in government jobs should be filled and they should be recruited as teachers, telephone operators and so on, they told the Chief Minister. Mr Chautala accepted the memorandum but refused to give them any assurance, it was learnt. Following the agitation, the Chief Secretary as well as the Director, Social Welfare Department, also wrote letters to various government departments for intimating the government regarding the backlog in the handicapped recruitment quota. But strangely, nothing further has happened despite these letters. Reminiscent of the bygone era, when locomotives steamed on these tracks. This heritage of the Railways lies in a state of neglect at the Kalka station. While the existing railway section and structures along the heritage route have been bedecked for the occasion, nothing has been done to highlight the importance of these erstwhile tracks. Sections of these out-of-use tracks, referred to as bull-headed tracks owing to their shape, are being used for shunting trains. Once flat-footed tracks (now in use) replaced this particular type of tracks, the Railways started using them for secondary purposes, says an official. The original sleepers of sal wood also lie buried under these tracks. "The Railways have done nothing to inform the people about the importance of these tracks. It was these lines on which the first train of the North-Western Railway covered its maiden trip from Kalka to Shimla", says Mr Bhola Nath, a former driver of diesel locomotives. 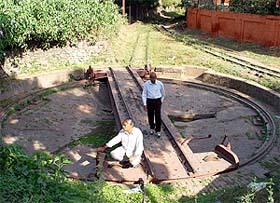 Looking for Railways apparatus from the Raj period at the Kalka station, the Tribune team came across a turntable, used to turn locomotives around, behind a diesel locomotive shed. The apparatus is still being used for turning around motor rail cars. Mr Vishnu Digambar, who joined the Railways in 1954, recalls that earlier diesel locomotives were also put on the turntable. But he expressed dismay over the vital equipment being ignored by during the ongoing celebrations. It appears that an inspection van and a brake van of the North-Western Railway, built in 1934 at Moghalpura (Lahore) are also not part of the celebrations. These pieces of heritage should have been placed at such a location that they might draw the attention of tourists, said another former employee of the Railways. According to the local police, a car (HR02G-3622) collided with a Himachal Roadways bus (HP 63-0155) on the national highway at Samana Bahu, near Nilokheri (Karnal). The car was on way coming to New Delhi from Ludhiana. According to the police the occupants of the car who were returning after attending a wedding were residents of Rohini (New Delhi). They have been identified as Devinder Singh, his wife Simran Kaur and his mother Gurcharan Kaur. Devinder Singh’s father-in-law Mallu Ram, his mother-in-law Nimmy, daughter Harmeet Kaur and son Harpreet Singh were also in the car. While Gurcharan Kaur and Harpreet Singh died on the spot, Mallu Ram succumbed to injuries at the local civil hospital. The local police has registered a case and impounded the Himachal Roadways bus. In just over a year after a Sirsa-based journalist, Ram Chander Chhatarpati, was murdered for allegedly writing against a religious organisation, a Division Bench of the Punjab and Haryana High Court today directed probe by the Central Bureau of Investigation (CBI) into the matter. The Bench, comprising the Chief Justice, Mr Justice, B.K. Roy and Mr Justice Swatanter Kumar, in fact, directed the transfer of all first information reports registered in the matter to the CBI. The editor of “Pura Sachh”, Chhatrapati, also a correspondent for a national daily, had succumbed to his injuries in a hospital after he was shot at in October last year. In a related incident, a Kurukshetra resident had alleged the murder of his only son by organisation members. The father, Joginder Singh, had claimed that his son was killed in broad day-light as the members were suspecting him of being involved in the circulation of a letter addressed by a girl to the Prime Minister. The letter had, subsequently, appeared in the newspapers. Today, acting on the petitions, the Bench directed the CBI to file its report in all the FIRs, including supplementary challans wherever necessary, before the courts of competent jurisdiction, within six months from the date of pronouncement. The Bench added that the courts, where charge-sheets had already been filed but recording of evidence had been stayed by an interim order, would not proceed with the recording of the same till the filing of the reports by the CBI. The Judges added that Superintendents of Police posted in Kurukshetra district and Sirsa, including the Investigating Officers of the Crime Branch, would hand over the complete record and fully cooperate in the expeditious conclusion of the investigation by the CBI. In their detailed order, the Judges ruled: “Both the incidents of murder are daring examples of their kind and allegations have been made that they were at the behest of the dera. The Judges further ruled: “The court is conscious of the fact that the CBI’s investigating officer might be burdened as stated by their counsel because of the pendency of a number of cases with them. But the present case is of the kind which requires immediate attention of all concerned from all quarters. The allegations made are of very serious kind and relate to a large number of sadhvis who have allegedly left the dera or are still working as a part of it”. In his petition for handing over the investigation of the first information report registered on October 24 last year under Sections 302, 120-B and 34 of the Indian Penal Code, the journalist’s son, Anshol Chhatarppati, had earlier submitted that the police was shielding the prime accused in the case as evident from the facts and circumstances. JP, as he is popularly known, was arrested from his residence in Jind on October 20 following a complaint of assault and ransacking lodged by a ruling Indian National Lok Dal activist at Barwala on October 19. The Punjab and Haryana High Court on October 7 had fixed November 13 as the date for final hearing on the plea preferred by JP for quashing the FIR registered against him at Pundri police station in Kaithal district, pleading that it was a political victimisation. The Haryana Government has filed its reply to the points raised in the petition before the high court. The elite Indian Air Force (IAF) Surya Kirans are all set to emerge as the world’s best formation aerobatics team. The Surya Kiran team is likely to participate in an international meet in Singapore. The team is gearing up for a heart-stopping display at the Asian Aerospace 2004. The team has performed in Sri Lanka in March 2001 on the 50th anniversary of the Sri Lankan air force. There are only three renowned nine aircraft aerobatics teams in the world. 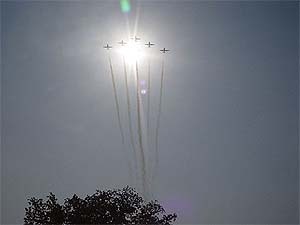 These are the Red Arrows of the Royal Air Force, the Canadian Snow Birds and the Indian Surya Kirans. Even US, Russian and Japanese air forces have only six aircraft aerobatics teams. Unlike most teams, which fly either frontline jet trainer or an advanced jet trainer class of aircraft, the Surya Kiran team flies the indigeneous basic jet trainer, the Kiran MK-II. The team comprises pilots drawn from different fighter aircraft streams that include Mirage 2000, MiG 29, Jaguar, MiG 23 and MiG 21. The team flies the Kiran aircraft, also used for basic flying training of pilots in the IAF. The pilots operate at speeds between 200 and 600 kmph and fly within a height band of 30 to 1,500 metres. The elite team held a heartwarming display at the Ambala airbase this afternoon. The show started off with a formation take-off, followed by loops, barrel rolls and wing overs. In the second phase, the team carried out precision manoeuvers like splits, level and rolling crosses and inverted runs. The ‘heart loop’ carried out by the synchro-pair was appreciated by the audience. A number of schoolchildren witnessed the unique air display. The students particularly liked the crossover of two Surya Kiran aircraft at high speeds. Though the well-attended air show started a little late due to the weather, the wait proved to be worth it for the audience. 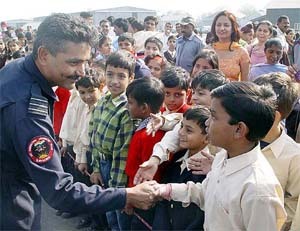 The team members interacted with the students after the air display. A young student told the team members that he too wanted to become a pilot. 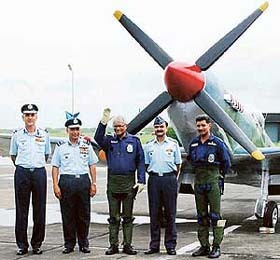 The Surya Kiran team was led by Wing Commander S. Prabhakaran. The other members of the team were Sqn Ldr Anil Gulrajani, Sqn Ldr Prashan Arya, Sqn Ldr M.L. Singh, Sqn Ldr Monish Yadav, Sqn Ldr Sanjeev Sethi and Sqn Ldr Sanjay Khajuria. Sqn Ldr Ramesh, Sadashivpeth, Prajual Shah, Kunal Shah, Phadke and Cruz were the other members of the team, besides Flt Lt Bhavna Mehra, who was the commentator. The red and white Surya Kirans were designed by Dr Gadge, the then Chief Engineer of Hindustan Aeronautics Limited, in 1960. The Kiran was subsequently produced at HAL Bangalore. The aircraft weighs about five tonnes and is powered by an orpheus engine that generates a thrust of 1906 kg, with the aircraft also to achieve a maximum speed of 0.7 mach. Apart from its integral guns, it can carry two 250-kg bombs and 68-mm rockets. AMBALA: An aircraft, which remained buried under soil in the Markanda river bed for more than five decades, has been finally dig out and restored to its former glory by the Air Force. The Spitfire aircraft had crashed in 1947 near Rolaheri village in the Mullana area. The fighter aircraft was detected by a farmer who was digging near the river to plant vegetables. Apparently, the river changed course in the past couple of decades which led to the aircraft being recovered from near the river bank. Air Force officials from Kalpi air station, who began the salvage operation of the aircraft, worked for nearly four days to dug out the Spitfire. The inaccessibility of the terrain posed a challenge to the salvage work. Initially, when the wreckage was detected, it was not clear whether it was an aircraft. But as digging progressed, and wings were found it became apparent that the wreckage was that of an aircraft. Labourers were put to work to dig out the aircraft but manual efforts had to be replaced by machines. As the river bed was soft, it was difficult to get heavy machinery there which could easily dig out the aircraft. Through persistent efforts, machines were brought near the spot to speed up the operation. The salvage operation was a partial success since the aircraft was badly damaged while being dig out. Portions of the aircraft were practically ripped apart when machines were used to drag out the aircraft which was stuck in mud. The badly damaged aircraft was then carted away. While those who carried out the recovery operations further damaged the wreckage, the Air Force personnel of the repair and salvage unit restored the aircraft to its former glory. Those who had seen the wreckage could hardly believe that such a badly damaged aircraft could be repaired to look like a brand new aircraft. The Spitfire was put on display during the visit of Union Defence Minister George Fernandes to the Ambala airbase recently. According to information available, the Spitfire which had crashed on the Markanda river bed was being flown by A.D. Cruz, a pilot of the Royal Indian Air Force. The Spitfire had developed some trouble but the pilot managed to bail out. The aged residents recall that such an accident took place and Air Force officials took away some equipment from the cockpit. Thereafter, India gained freedom and the wreckage was forgotten, till a chance find by a farmer. It is said that Spitfires were largely responsible for the air superiority of England as compared to that of Germany. During the Second World War, the Spitfires played a major role and there are innumerable tales of Spitfires having caused extensive damage behind enemy lines. The Spitfire was so named as its blazing guns would `spit’ fire. The Spitfires came into being in the 1930s and it was then inducted into the Royal Air Force. The Spitfires reached India in mid 40s. Various competitions were held at Bal Bhavan, Ambala City, today. In the fancy dress competition, 3-7 years, Ashima and Aditya were first, Manisha and Vasu second, and Saristi and Sayna third. Consolation prizes went to Astha, Inder Rattan and Gurnoor Singh. In the 7-10 years category, Rahul Handa was first, Kriti Chopra second and Mannat third. Consolation prizes went to Akshit and Roma. In fun games, girls, 12-16 years, Usha Saini was first, Rosy Gupta second and Anubha third. Ashima got the consolation prize. In the age group 16 to 18 years, Sonia was first, Honey second and Shelly third. the consolation prize went to Megha. In fun games, boys, 12-16 years, Nitin Mohan was first, Taranjeet and Abhishek second and Mukul third. Mohit got the consolation prize. In the age group 16 to 18 years, Varun was first, Mudit second and Sharnam and Saurabh third. Himanshu got the consolation prize. In a condolence message, the Chief Minister, Mr Om Prakash Chautala, expressed deep shock and grief over Mr Rathi’s death. He said in Mr Rathi’s death the state had lost a great social worker and a seasoned politician. The President of the Haryana Congress, Mr Bhajan Lal, in his message to the bereaved family said Mr Rathi was a popular leader of Bahadurgarh and would be remembered for his considerable contribution towards the welfare of the people of the area. A 1974-batch officer, Mr Maheshwari was born on January 20, 1950. He was posted as Financial Commissioner and Principal Secretary, Housing. His elder daughter, Swati, is a journalist with NDTV. His younger daughter is studying in the Indian Institute of Management, Ahmedabad. His wife, Belu, who teaches History at Panjab University, is also a regular contributor to newspapers. The Chief Minister, Mr Om Prakash Chautala, has expressed deep shock and grief over Mr Maheshwari’s death. The cremation will take place at 11.30 am tomorrow. The local police has arrested two pickpockets and seized eight mobile phone sets worth Rs 50,000 and some cash from them. Talking to mediapersons here today, the district police chief, Mr K.K. Rao, said those arrested had been identified as Neeraj of Allahabad district, now residing in Sector 7 here, and Balli of Malerkotla, now residing at Bhagwan Nagar Colony, Pipli, 5 km from here. According to Mr Rao, both had been operating at the bus stands of Panipat, Karnal, Kurukshetra and Ambala. The Haryana Government has partially restored the facility of leave travel concession (LTC) for its employees. An official release said the facility would be made available to the employees who have two years or less for retirement. However, all the officers of the All-India services (IAS, IPS etc) will be able to avail the facility.